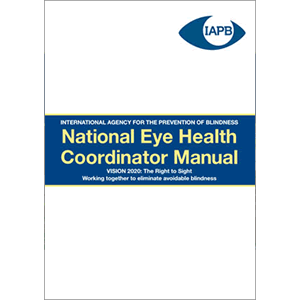 This manual aims to guide National Eye Health Coordinators in the daily challenges they face in their work, developing, managing, facilitating and managing national eye health plans. The material is organised into sections, each with learning objectives. The various sections are designed to stand alone so that readers can skip to sections of most interest. All enquiries may be directed to communications@iapb.org. Publisher: International Agency for the Prevention of Blindness.